Application and database performance optimised. With up to eight Alpha EV7 processors, the HP AlphaServer ES80 system is ideal for building your departmental-level environment, especially when you demand absolute, flat-out application and database performance. 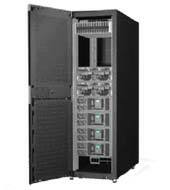 Available as a scalable 2-, 4-, 6- or 8- processor rack system, the AlphaServer ES80 system packs an amazing amount of power and headroom into a small footprint. Partitioning into one to four segments, this is the most flexible mid-range server we think you’ve ever seen. Whether you have a commercial infrastructure to build, digital special effects software to master, mountains of databases to sift through, or need application performance that goes beyond what’s available today, think AlphaServer ES80 systems.